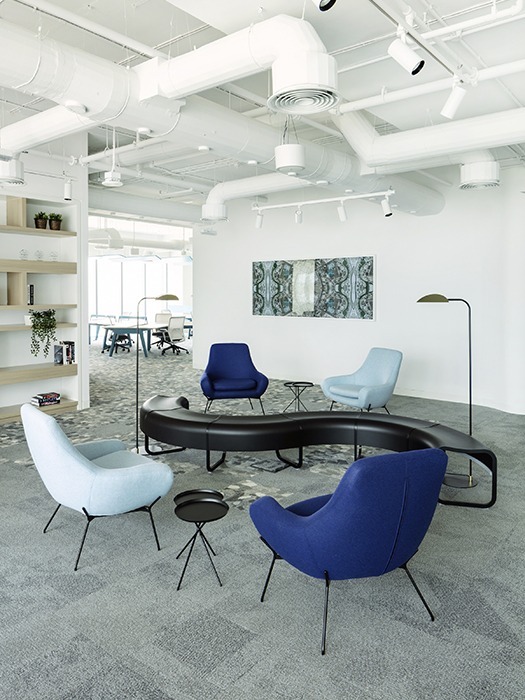 The new headquarters of PR agency Edelman in Dubai has been decked out by interior design company Roar (formerly Pallavi Dean). The Dubai office, a 1,000sqm-space located in the prestigious DMCC ONE JLT building, is the hub for Edelman’s creative and commercial teams; and builds on the success of Edelman’s Abu Dhabi office, which Roar designed and delivered in 2016. “One of the big design challenges with Edelman Dubai was to create a link to their Abu Dhabi office, and yet give it a distinct character,” says Pallavi Dean, founder and creative director of Roar. 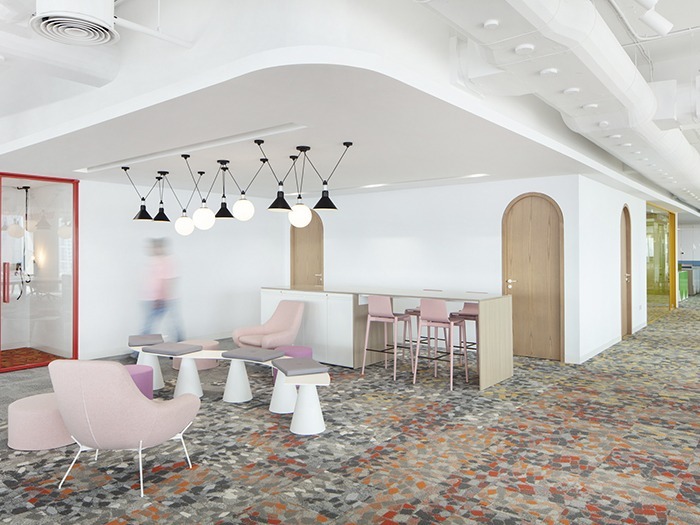 ‘Civic Square’ – the main reception zone – has a rich hospitality look and feel while the main work zone, where most staff sit, is more playful, rich with a vibrant ombre colour scheme. The ‘Urban Park’ is different again. This is a public space with an amphitheatre and cafe-style seating. Edelman straddles two worlds, working to attract young, millennial creatives while appealing to its high-paying clients who are senior managers in banks, large companies and the government. Roar managed to bridge these two demographics with its ‘City Lofts’ space. This is the most mature, sophisticated space in what is otherwise a quite playful project. It’s a flexible hybrid of a meeting room, co-working space and a private office. The success of this project was no fluke, rather the result of a rigorous planning process. “Whenever we start a project, we use a unique process called UXD, ‘User Experience Design’, and we feel that if we invest a lot of time doing the proper research and needs-based analysis for the client we wont have that many changes through the course of the design. Before we even hit pen to paper, we spend two weeks in different focus groups, middle management, employees, and even other stakeholders in the business, to really understand how they work and what they want the space to do for them,” said Dean. This same planning technique was used by Roar on Edelman’s Abu Dhabi office. This time, however, the design team worked with Herman Miller’s workplace psychology team, using their ‘Living Office’ process. The result was a deep understanding of the needs of senior and junior staff, and a thorough, research-based set of guidelines to frame their design decisions. The psychology was based primarily on the use of colour after a study conducted by the University of Texas showed how colour impacts mood and wellbeing. “We used a lot of colour in the space, which was very considered and responded to the creative team’s requests, such as a space where they could rest, and looked at how yellow can support productivity and creativity. “For the finance team we used baby pink, if you look at all the research that’s coming out on colour psychology, it says pink calms people down. Therefore, if you are looking at big bills for the end of the month it helps that you’re in a baby pink space,” continues Dean. Blue is the dominant colour in the entrance, reflecting Edelman’s branding, and green and pink are used in the Urban Park area. In between the two, gradient colour transition takes place, which serves as a wayfinding device and gives each department an identity. Despite the extensive planning, as with all projects, there were still issues the team had to overcome in order to complete the project as Dean explains: “I think one of the biggest constraints, which I would actually say turned out to be a great opportunity, was the budget. If you have an unlimited piece of string, you can weave an amazing story and you can do limitless things with it, but we had to really consider our design decisions. “We didn’t compromise on the ergonomic furniture, we got the latest and best chairs and Herman Miller desks. For the breakout spaces we found a really cool Danish brand that was very economical and cost-effective. We had a lot of the joinery custom-made here in the UAE, which was another saving point. “We were very clever about how we used the lighting as well within the space. We had decorative feature lighting from Petite Friture and we found a really economical brand, Aromas del Campo, which makes beautiful lighting pieces. The lighting of the space, which includes pieces from Flos, Estiluz, Studio Italia, Aromas del Campo, DCW Editions, Seletti, Excloosiva, Petite Friture, Vibia, Zerolighting, Axo Light, and Mathieu Challieres, was as rigorously planned as the rest of the project. The Roar team knew exactly how to combine the artificial lighting with the office’s natural light. “All the studies we looked at talk about how important the role of artificial lighting that supports natural lighting is to worker productivity. We worked very closely with a lighting consultant and before we even started with the decorative fittings we worked out all the lighting levels and that there should be a bare minimum between 300 and 500 lumens at any point in the workspace depending on where you are. “We did the overall lighting strategy first and placed the lighting a good distance away from the windows in order to light the areas untouched by natural light. Then we looked at decorative fixtures that would support the overall lighting strategy. They looked stunning but weren’t going to provide enough light for an office space so we went with a track system throughout. We then added decorative lighting features purely for that reason, decoration. “The lighting was also integrated in some of the art. We had made use of some fish wallpaper in one of the individual workspace rooms and in the eye of the fish we put a light. It’s not just thinking of lighting and how it can fit in the space, it’s how we can incorporate it with the design of the artwork. In the ‘City Lofts’ area, a more sophisticated use of lighting was implemented, to counter-balance the more playful areas and to entertain their high-paying clients. “None of the upper management wanted their own offices so we created a dedicated office space upstairs that they can use as and when they need to. We ordered some beautiful Studio Italia Nano fittings for the reception area but then we commissioned an artist who needed a completely different lighting system. He wanted spots to drop over the reception, so we re-used the fittings and created a chandelier. 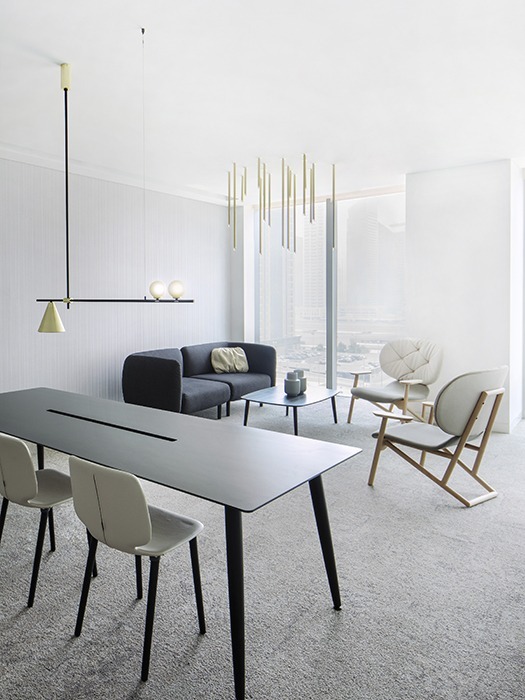 The finished product was a space clearly situated in Dubai and the perfect place for the PR agency to entertain clients and attract potential employees. “We’ve had really, really positive feedback,” continues Dean. “I looked at my Instagram page recently and the CFO had written a comment saying: “Thank you so much, you made all our dreams come true,” and I thought “wow, I can do that?” All they asked me to do was make sure that clients can come for meetings and now their clients bring their own clients into the office space. For a PR agency, what more could you ask for? The variety of lighting used for this project is vast and the placement concise. From spots and task lighting to decorative pieces selected to match the feel and design of each section, Roar have created a uniquely lit space for Edelman to be proud of.